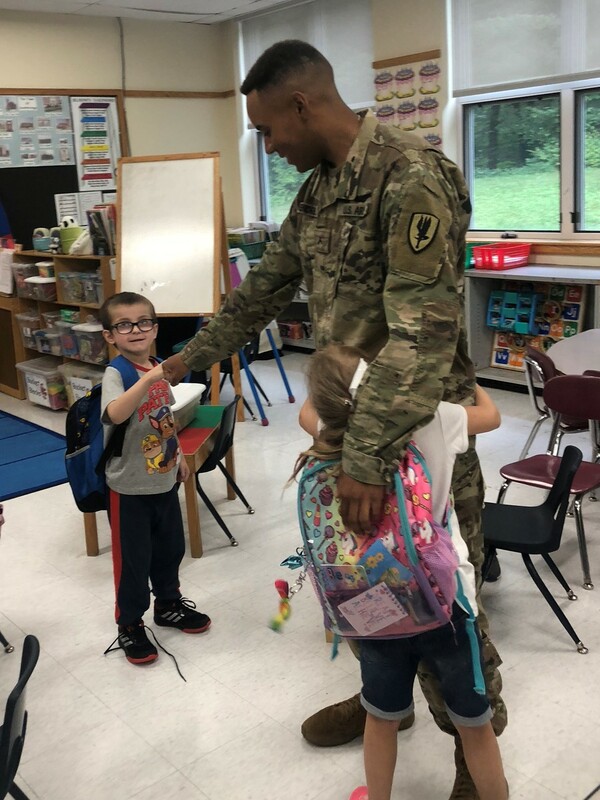 📷 Rylee Mongeon, 5, of Southbridge greets her brother Zachary Gendreau, who surprised her at Eastford Road School after completing Army basic training. Rylee did not know that her brother was back home. SOUTHBRIDGE – It was an ordinary day for Ryleee Mongeon, age 5 of Southbridge who is a kindergarten student at Eastford Road Elementary. She sat quietly in her classroom Thursday, September 13 with her peers as the end of the school day drew near. Then, one of her teachers called out to her and pointed to her older brother Zachary, who had just walked into the room behind her. “Hi Zachary,” she said, with a demeanor that was a bit calmer and quieter than the adults around her had expected. “My brother,” she replied as Zachary picked her up for a big hug. 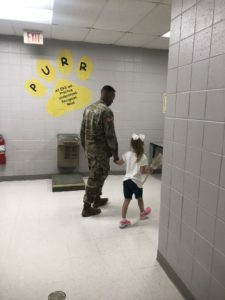 Rylee was able to visit Zachary briefly during a family event at Fort Sill. Rylee’s brother Zachary Gendreau, 20, had just walked into the classroom to surprise his younger sister. 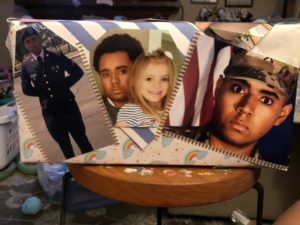 Gendreau has just finished basic training and advanced training in the Army, and he is home for a short period of time before he moves on to his duty station of Fort Riley in Kansas. 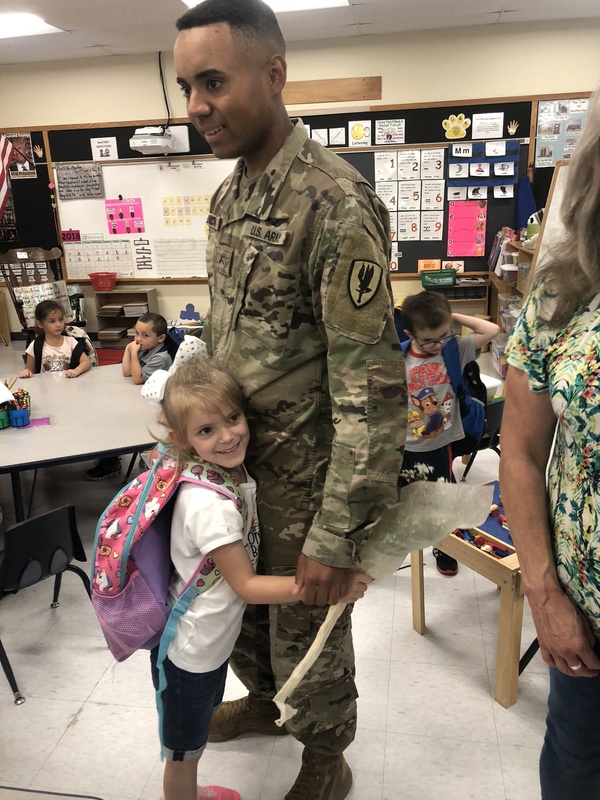 Riley and her mother, Jennifer Gendreau, had visited Zachary for a family event at Fort Sill, Oklahoma, where Zachary completed basic training. Other than that though, Riley hadn’t seen the big brother she adores for a long time. She certainly didn’t know that she would see him today. A photo collage celebrates the special bond between brother and sister. Photo courtesy Jennifer Gendreau. 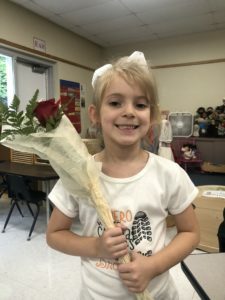 When Zachary walked into the room, Riley was visibly surprised, but she was a lot quieter than her mother had expected. Her mother had anticipated a loud shriek to fill the room. 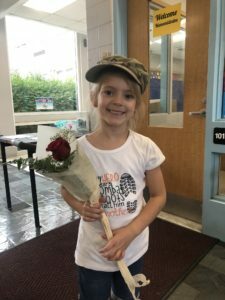 The older brother handed his sister a rose and gave her a big hug. After the initial greeting and hugs, classroom teacher Susan Frabotta asked Riley what she thought when she saw Zachary walk in the room. “I was happy, but I had to use my indoor voice!” replied the youngster, who had shown considerable restraint and respect for classroom rules. After the initial greeting between Zachary and Rylee, Zachary walked around the room and gave the kindergarten students high-fives and fist bumps. Zachary completed basic training at Fort Sill and his advanced training at Fort Huachuca in Southern Arizona. 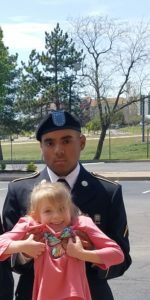 The new soldier is from Southbridge and graduated from Bay Path Regional Vocational High School in 2016. Zachary’s family, including mother Jennifer Gendreau, grandmother Janice Gendreau, grandfather Donald Billings and other extended family are happy to have Zachary back, if just for a short time and they are proud of their newly minted soldier. Zachary Gendreau gives a fist bump to Brayden Shutts, while Gendreau’s sister Rylee hugs him. Zachary surprised Rylee at the end of the school day and the two walked out of the school together to enjoy some family time. Rylee beams as she holds the rose that her brother brought her in her classroom.